Party goers on the East Coast were graced with two brilliant fireballs last night. The first bolide (event #1143) entered the atmosphere over north central PA around 9:05 PM Eastern time and was traveling from the east-south-east to the west-north-west. 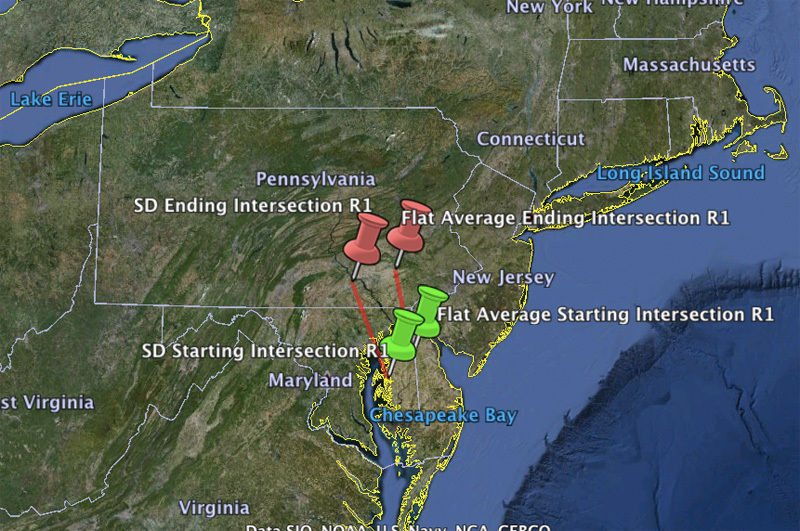 Click the trajectory map below to view the witness reports for this event. The AMS also received 18 additional reports for a fireball on the East Coast approximately 3 hours later at 12:05 AM (event #1144). While the vectors for the 2nd sighting put the object much farther south initially it was not clear if this was a separate event or if a large volume of witnesses reported the wrong time (certainly possible on a holiday weekend). We have contacted some of these witnesses in an attempt to confirm the reported time and have verified this was in fact a separate event. Below is a map of the second fireball event. If you saw either of these events please fill out an official fireball report. I saw the first of the Memorial Day fireballs from University Ave. near Atlantic Ave. in Rochester NY. It was traveling from left to right as I faced SSE. It was much brighter than Venus, which I also saw later that evening along with Mercury and Jupiter. It lasted just moments and rapidly grew in brightness before disappearing in a flash of light. This is the one I saw while observing the triple planetary conjunction. Pure white. Moved about one third speed of meteor. More like a Roman candle. I saw 2 meteors this past weekend on 5/25/13. I saw one at approx. 05:45 a.m. from the Royal Gorge in Colorado, and one on the same day at 17:48 p.m. from Canon City in Colorado. The one in the a.m. went behind a mountain around 05:47 and I lost sighting (but I did get photos), and the one in the afternoon started to burn up around 17:49, but I missed it because I got distracted at an event. I did get 3 photos of the one in the afternoon also. I saw the later event. 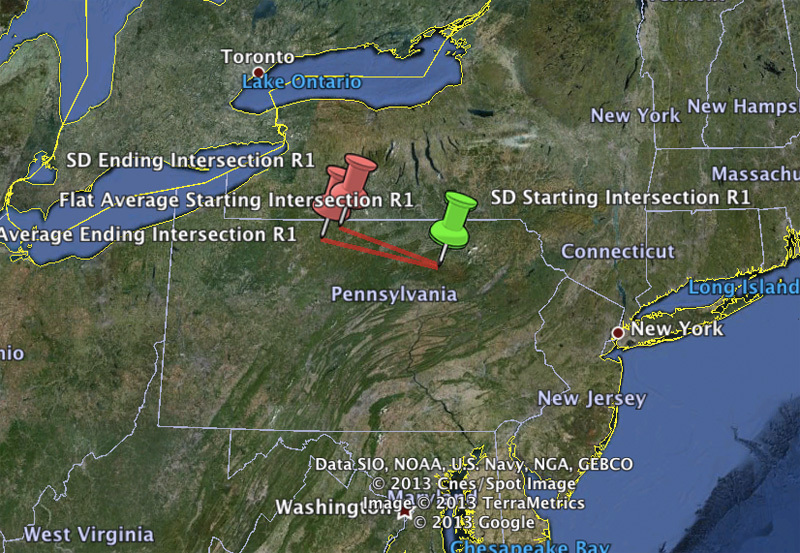 I am located 1 mile southwest of Millersville, PA. I was facing the southwest sky sometime around midnight on the 26th. My brother-in-law saw the earlier sighting just around sundown on the same day, approx. 9 – 9:15 PM. He was facing to the northwest. I witnessed #1143 in Scranton, PA. DESCRIPTION: Saw very briefly; 2-3 seconds while sitting on front porch; traveled from back of house to front in generally WSW direction approx 240 degrees compass heading with slight downward trajectory; altitude appeared to be under 1,000 feet; velocity appeared to be subsonic; short viewing duration due to obstruction from porch roof above & large tree in front located behind house across street; appearance described as “flaming arrow;” arrowhead resembling flame of bunsen burner; brilliant bright blue flame outlined by thick layer of brilliant bright white outlined by thin layer of glowing yellow-orange; no concurrent or delayed audible acoustics; no mechanical vibration, shock or after shock sensation; no air disturbance; immediate & brief appearance of aircraft traveling in opposite direction at approx. 180 degrees opposing fireball travel; also obstructed by the aforementioned tree; immediate appearance of helicopter aircraft in S sky approx 185 degrees compass heading; date & time 27 May 2013 at 00:06 EDT.